The house that Henri Sayes designed for himself and his wife, Nicole Stock, is distinguished by a cutaway in the cedar cladding that mirrors the angular double-height space within. In the yard, a grassy berm, fashioned from earth excavated for the foundation, takes the place of a fence. In the office, a Tolomeo desk lamp from Artemide rests on a desk that Stock designed and built in her university days. The Static shelving is by Lundia. Sayes designed a pegboard screen to hide a bathtub and wash basin in the downstairs bathroom, and used the same shade of salmon-hued paint from Resene on the ceiling in the master bedroom. Sayes fashioned the pendant lamp from common parts, including a ceramic socket and a G125 incandescent lightbulb. Sayes and Stock furnished their living area with a Slow Chair by Ronan and Erwan Bouroullec for Vitra, and a Spar floor light by Jamie McLellan for Resident. A print by Stephen Bambury and an American Modern pitcher by Russel Wright sit atop a sideboard that Sayes built while studying at the University of Auckland. 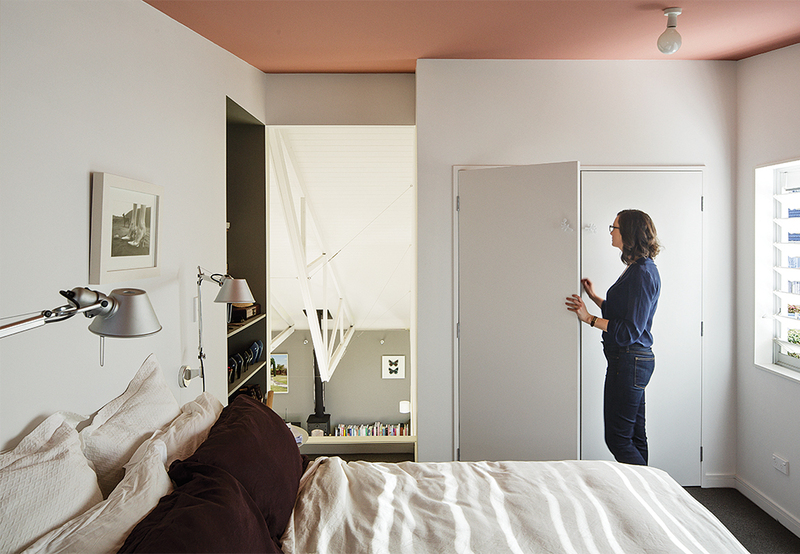 The master bedroom features an unobstructed door-sized opening onto the double-height great room. A pair of Tolomeo classic wall lamps from Artemide hang next to the bed. 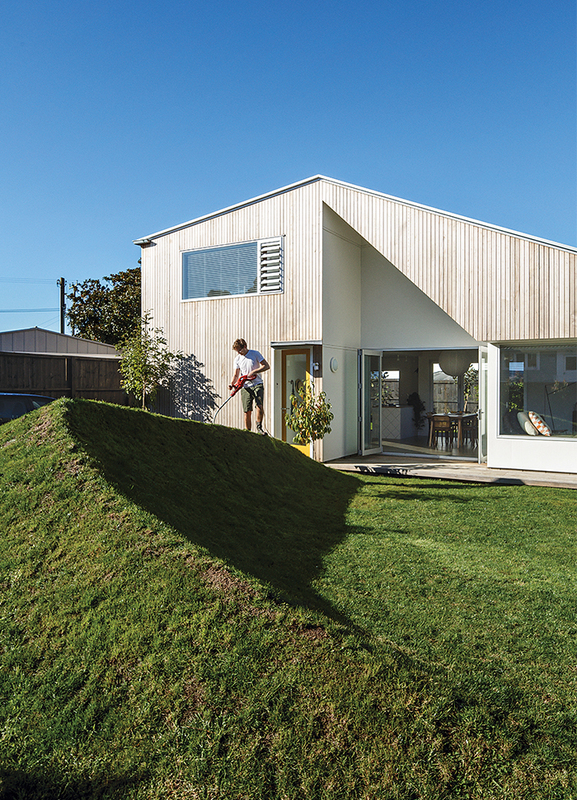 The sharply asymmetrical outline of Henri Sayes and Nicole Stock’s house sets it apart from its neighbors, most of which are nondescript bungalows of the sort common to the couple’s hometown of Auckland, New Zealand. It reflects a deliberately idiosyncratic approach that carries over into the front yard, where a contoured, grass-covered mound rises at the edge of the pocket-square lawn. For the two enterprising and architecturally savvy first-time homeowners, this 1,200-square-foot house is a self-conscious response to the sharply rising cost of real estate in New Zealand’s largest city. Despite its arresting appearance, this modern interloper is, in its way, as unassuming as the buildings that surround it. These consist of a double-height open living and dining area and smaller ancillary rooms. 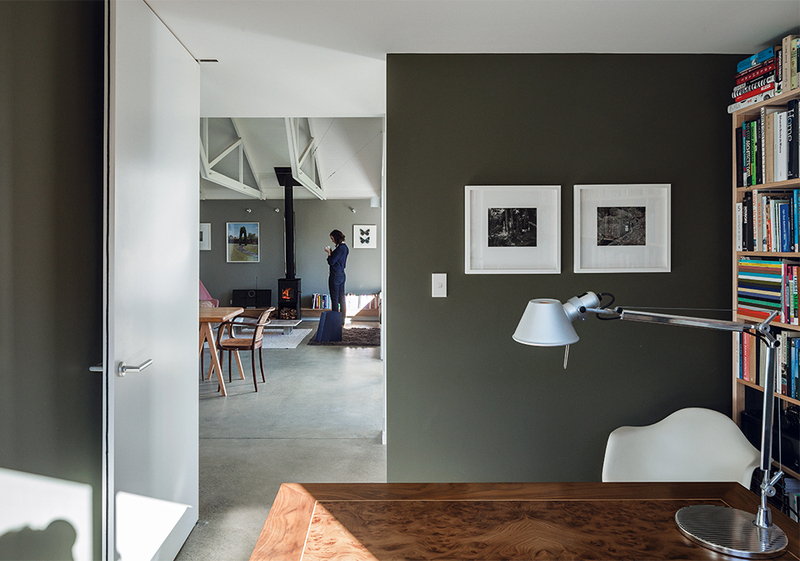 The different areas are defined by variations in materials and ceiling height: The tiled kitchen and the reading room are tucked beneath the bedrooms, one of which—Sayes and Stock’s—is partly visible through a vertiginous floor-to-ceiling cutout overlooking the ground floor. Precise fields of color—the wash of pink on the bedroom ceiling, for example—from a palette of soft pink, gray, and green, also help to define individual spaces. One of the most striking features is the set of exposed trusses that, in addition to performing the practical function of supporting the roof, create the illusion of different ceiling heights over the dining table and its adjoining living area. 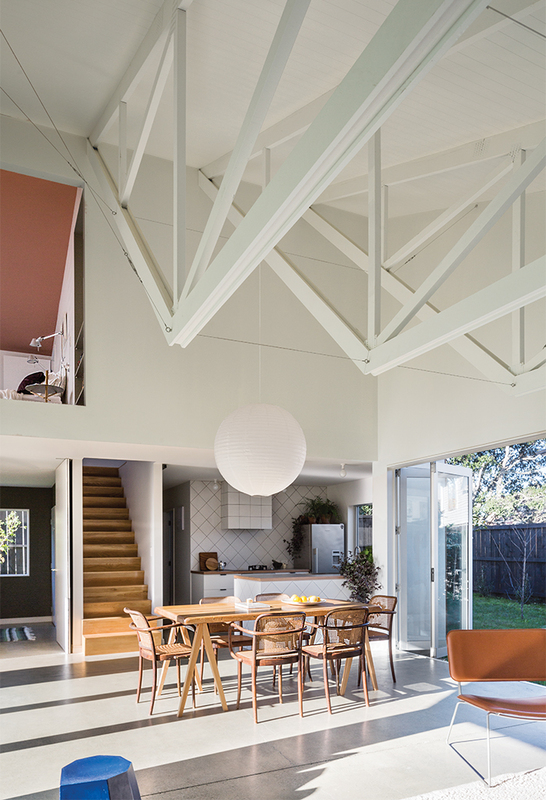 The ceiling soars over the former, while the bottom edges of the trusses hover above the lounge and its cozy window seat like a ceiling that is, simultaneously, barely there. These are, in fact, standard-issue agricultural trusses, which Sayes simply inverted and set into a slight recess in the wall where the paint stops and the pitched ceiling begins. “The bottoms of the trusses create a kind of invisible flat ceiling above the living room and define it as a more intimate space, though technically it still has the height,” he says. Outside, the exterior cedar cladding—“our one big splash,” Sayes says—cuts away to reveal a recessed triangular section of white-painted plywood that hints at the geometry within. An overall sense of informality carries over into the interior, where Sayes deliberately deviated from the classic suburban model of a house that encourages family members to sequester themselves in separate rooms. Sharing is mandatory, and the open living-dining area was designed with large dinner parties in mind. “We were working to different priorities, and one of those was space,” he says. Construction took about six months and was completed in September 2013. Having begun with a building form that was so assiduously reduced to basics, the two seized opportunities to make small design changes during the building process.